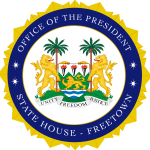 State House, Freetown, Friday 15 February 2019– The new Director of Public Prosecution, DPP, Easmon Nathanael Ngakui, has subscribed to the Oath of Office before His Excellency President Julius Maada Bio in line with Section 66(2) of the Constitution of Sierra Leone at a ceremony held at State House. Shortly after the swearing-in ceremony, the new DPP said he was grateful to the President for the opportunity given to him to serve his country in his new role. He said the task ahead was enormous, however, he expressed optimism that with the help of God and the support from the President he would be able to perform well in his new job. He mentioned that the good side was that from hindsight he already knew the problems ahead of him and assured that he would be ready to do his best and would not disappoint the President. The Office of the Director of Public Prosecution was created by the 1991 Constitution with the powers to institute and undertake criminal proceedings against any person before any court in respect of any offences against the laws of Sierra Leone; to take over and continue any such criminal proceedings that may have been instituted by any other person or authority; and to discontinue at any stage before judgement is delivered in any such criminal proceedings instituted or undertaken by himself or any other person or authority.